Let us perform your bumblebee removal for your safety as well as the hive. When you draw a picture of a bee for a child, you usually are drawing the cute and cuddly-looking bumblebee. With its fuzzy little body and cartoonish appearance, it’s no wonder that most of us don’t have particular fears about bumblebees. Even its name doesn’t exactly strike terror into the heart of someone who hears it! Bumblebees are generally not aggressive, but that doesn’t mean that they aren’t wild creatures who will defend themselves when threatened. 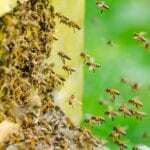 If you have discovered a growing hive or swarm of bumblebees on your Lakeland, Florida property, our team at Florida Bee Removal would like to help with our bumblebee removal services. When you call us at Florida Bee Removal for bumblebee removal services, you can count on us to perform your bumblebee removal safely and without incident. We have been doing literally hundreds of bee removal services every month since we started our business 56 years ago, so you know that experience is definitely on our side! We can remove your bumblebees, clean the area where the hive was located, and take care of the bees as well. If you prefer to have them relocated to another area, which is recommended since bees are dying off by the thousands, then we will do so in such a way that they aren’t tempted to come back around looking for their old hive! For bumblebee removal in your area, call the best around! Give us a call here at Florida Bee Removal for the best in bee removal of all types in the area.